Wouldn't it be lovely if the EuroMillions Lottery made you an instant millionaire? Winning the lottery is a universal dream all over the world. The thought of paying down debt, leaving a terrible job, purchasing a new home or a fancy new car is one that almost every member of the labor force has had at one point or another. And for some people, that dream has come true. It is no secret that the EuroMillions Lottery produces millions of winners in every single draw, but it has also produced some of the largest jackpots in lottery history. Such is the case with Adrian and Gillian Bayford from the UK. The Bayfords won a staggering €190 million in August of 2012, the largest jackpot to date. If that is not enough to propel you to take your chances and purchase your own lottery ticket, then consider the case of Chris and Colin Weir, who won an impressive €185 million, but received a larger amount thanks to a favorable Sterling exchange rate. 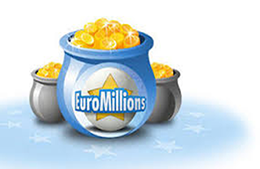 Since its inception the EuroMillions Lottery has produced jackpot winners from every single participating country. These countries include France, Spain, Portugal, the UK, Belgium, Switzerland, Austria, Ireland and Luxembourg. France alone has netted 76 jackpot winners, with Spain a close second at 70. Interestingly, the most notable syndicate winners came in March 2012, when a group of 12 bus drivers from Corby in Northhamptonshire, UK won a whopping shared jackpot prize of €38,034, 639.70. One can only imagine their joy. When it comes to holding records, none beats the 100 UK Millionaires raffle, which occurred on Friday, July 26th, 2013. This particular raffle produced the highest number of millionaires created in a single night and presently holds the world record for that accomplishment. The raffle offered the EuroMillions Lottery players the chance to win one hundred 1 million raffle prizes. This event coincided with the much anticipated and extremely successful 2012 London Olympics. The Olympics were partially funded through proceeds of ticket sales from the EuroMillions and UK Lotto. An amazing 97 winners came forward out of the 100 possible to claim their prizes. No doubt that was a night of celebration for every lucky winner at that event! What about you? Have you ever entered the lottery? If so, do you faithfully purchase your ticket, or do you wait until the jackpot hits an all-time high? I don't know about you, but I like the odds of the EuroMillions Lottery!